I can't believe I had never seen this classic before. I was flipping through Netflix watch now the other night and came across it and decided I'd give it a shot. Boy, was I glad I did. This movie is magical! It was funny how many times I thought of Rachel Berry while watching it, though! I now have added Barbara to my favorite people list. What's your favorite old movie? I'm definitely itching to watch more classic films! I have never seen Funny Girl before but I love Funny Face! Audrey is my favorite! 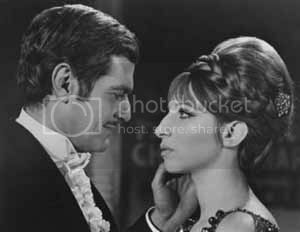 Funny Girl is a great one...another of my favorites is An Affair to Remember. Oh, and Jane Fonda is not my favorite person in the world, but I still just love her in Barefoot in the Park with the young and beautiful Robert Redford.